Although breastfeeding is universal in Ethiopia, ranges of regional differences in timely initiation of breastfeeding have been documented. Initiation of breastfeeding is highly bound to cultural factors that may either enhance or inhibit the optimal practices. The government of Ethiopia developed National Infant and Young Child Feeding Guideline in 2004 and behavior change communications on breast feeding have been going on since then. However, there is a little information on the practice of timely initiation of breast feeding and factors that predict these practices after the implementation of the national guideline. The objective of this study is to determine the prevalence and determinant factors of timely initiation of breastfeeding among mothers in Bale Goba District, South East Ethiopia. A community based cross sectional study was carried out from February to March 2010 using both quantitative and qualitative methods of data collection. A total of 608 mother infant pairs were selected using simple random sampling method and key informants for the in-depth interview were selected conveniently. Descriptive statistics, bivariate analysis and multivariable logistic regression analyses were employed to identify factors associated with timely initiation of breast feeding. The prevalence of timely initiation of breastfeeding was 52.4%. Bivariate analysis showed that attendance of formal education, being urban resident, institutional delivery and postnatal counseling on breast feeding were significantly associated with timely initiation of breastfeeding (P < 0.05). After adjust sting for other factors on the multivariable logistic model, being in the urban area [AOR: 4.1 (95%C.I: 2.31-7.30)] and getting postnatal counseling [AOR: 2.7(1.86-3.94)] were independent predictors of timely initiation of breastfeeding. The practice of timely initiation of breast feeding is low as nearly half the mothers did not start breastfeeding with one hour after delivery. The results suggest that breast feeding behavior change communication especially during the post natal period is critical in promoting optimal practice in the initiation of breast feeding. Rural mothers need special attention as they are distant from various information sources. Exclusive breastfeeding, preceded by timely initiation and appropriate complementary feeding practices are universally accepted as essential elements for the satisfactory growth and development of infants and for prevention of childhood illness [1–3]. Timely initiation of breastfeeding is defined as putting the newborn to the breast within one hour of birth. Timely initiation of breastfeeding is not only the easiest, cost effective and most successful intervention; it also tops the table of life-saving interventions for the health of the newborn [4–6]. Twenty two percent of neonatal deaths could be prevented, if all infants are put to the breast within the first hour of birth . The prevalence of timely initiation of breastfeeding in some developing countries other than Ethiopia was documented as in Ghana (41%), Sudan (54.2%), Zambia; (70%), Jordan (49.5%), North Jordan (86.6%), Nepal (72.2%), Bolivia; (74%). In Ethiopia, one third of babies do not receive breastfeeding within the first hour of birth and national prevalence of breastfeeding initiation was documented to be low with wide regional differences [1, 8–14]. Realizing the importance of timely initiation of breastfeeding, the Ethiopian government had developed infant and young child feeding guidelines giving appropriate emphasis to key messages on timely initiation of breastfeeding in 2004 . Since then, different interventions like breast feeding promotions have been given at health institutions and at the community level by community health extension workers and other health care providers. However, these efforts are not based on systematic evidence on the level of existing practice which might be due to the paucity of data from studies on timely initiation. Therefore, the study sets out to address the issues related to prevalence of timely initiation of breastfeeding and associated factors among mothers in Goba Woreda, Ethiopia. A community-based cross-sectional study using both quantitative and qualitative methods of data collection was conducted in Goba district of Bale Zone in the south Eastern Ethiopia. Bale zone is the second largest Zones in Oromia regional state with an area of 67.329.6 km2 and located 430 km from the capital, Addis Ababa. The temperature ranges from 3.5-32°c. The area is known by its eye catching natural and tourist appealing topography like Bale Mountains and Souf-Umor cave. Goba woreda is one of the 20 woreda in Bale zone having both rural and urban population. The district has one hospital, one health center and more than 20 health posts. According to Goba District Health Office report, the estimated total number of infants in the woreda is 1923 by the year 2009. The sample size was determined using single population proportion formula assuming an expected prevalence for timely initiation of breast feeding of 50% with a finite population correction. The sample was multiplied by a design effect of 2 and by 10% was added non response it giving the final sample size of 668. A total of 668 mother-infant pairs were selected using stratified cluster sampling technique from the urban and rural residences then census was conducted to get the sampling frame for selecting mother- infant pairs by simple random sampling technique. For the in-depth interview, 23 individuals (6 health care providers, 9 breastfeeding mothers-three urban and six rural and eight community health extension workers) were selected conveniently. Quantitative data were gathered using a questionnaire adapted from Ethiopian Demographic Health Survey, WHO, and LINKAGE project which were designed to assess infant and young child feeding practices in developing countries including Ethiopia [8, 14, 16]. The questionnaire was translated and contextualized to suit the local situation. Data on socio-demographic and economic factors (income, level of education etc), obstetric factors (like birth intervals, parity, Ante natal care) and health service related factors/practices including post natal counseling were collected by interviewing the mothers of index children. A semi-structured open-ended interview guide was used as a guide for the key informant interview. The data were collected by 12th grade complete students who took an intensive training for two days was given on the questionnaire and on general approaches to data collection. Timely initiation of breastfeeding was measured by asking mothers provide information regarding the time at which their index infant was put to the breast after delivery. The prevalence of timely initiation of breastfeeding was calculated as the ratio of infants below one year put to the breast within 1 hour of delivery to the total number of infants (< 12 months). Quantitative data were checked for completeness, inconsistencies, entered, coded, cleaned and analyzed using SPSS for windows version 16.0 (SPSS Inc. version 16.1, Chicago, Illinois). Descriptive statistics was computed to determine the prevalence of timely initiation of breastfeeding. Proportions were compared by timely initiation of breast feeding using Chi-square tests. First a bivariate logistic regression was performed. Variables that showed significant association with timely initiation of breastfeeding in the bivariate models were entered in a multivariable logistic model. To identify independent predictors of timely initiation of breastfeeding, a multivariable logistic regression model with timely initiation of breast feeding as dependent variable was constructed. All tests were two-sided and a P < 0.05 was considered statistically significant. We present the results as proportions, output of the logistic regression as Odds Ratios (OR) with 95% Confidence Intervals. The qualitative data were transcribed in to English language and analyzed manually. Data captured using the field notes were transcribed verbatim into English language and double checked by the investigator. The transcribed data were read carefully and categorized in to thematic frameworks and color coded. The data were summarized by thematic areas and presented in narratives triangulated with the quantitative data. Well-said verbatim of the study participants were used as illustrations in presenting the results. Letter of Ethical approval was received from Jimma university ethical clearance committee. Official letter of co-operation was also obtained from Oromia Health Bureau, Zonal Health Desk & Woreda Health Office. Informed verbal consent was secured from study participants in their own language explaining the purpose of the study, potential risk and benefits of partaking in the study and the right to with draw from the study any time. The participants were also assured about the confidentiality of the data. Out of 668 mother-infant pairs sampled, 608 were included in the analysis making the response rate 91.01%. The mean (± SD) age of mothers was 26.5 (± 5.5) years. Thirty six percent of mothers were in the age group of 25-29 years. Sixty nine percent of respondents were Muslims by religion. The largest ethnic group was Oromo 542 (89.1%) followed by Amhara 60(9.9%). Concerning the educational status of mothers, 371(61.0%) had attended formal school of which 275(45.2%) completed primary school (grade1-8). Sixteen percent of the study subjects completed secondary school (9th grade and above). Majority of the mothers were married 579(95.7%) and house wife by occupation 498(82.3%). Four hundred eighty-eight (80.3%) of the study participants resides in rural area (Table 1). Ninety nine percent of mothers had breastfeed at least once in their life time among which, 210(35.0%) of them squeezed out and discarded the colostrums and 104(17.2%) of mothers gave pre-lacteal food to their infants. In support of the idea of discarding colostrums, a 26 yrs old mother said ''... here in our communities, it is believed that colostrums(silga in Afan Oromo language) is not considered as a white milk, this might make the infant ill; therefore I discarded it out. "On the same issue a health extension worker from Aloshe kebele stated "...mothers refused to give the first breast milk which they throw away because it may cause abdominal cramp". With regard to the reason for pre lacteal feeding a 29 years old rural mother of said "...my infant's stomach cannot digest my breast milk; therefore I gave 'lega kibe'-meaning fresh butter to soften his stomach for the first two to three days." Distribution of mothers by the time at which they initiated breastfeeding in Goba Woreda, South East Ethiopia. "...Even if mothers initiated breastfeeding after one hour of delivery, most mothers who deliver in hospital do not breastfeed till they come to our health post which may take about three hours to walk". Timely initiation of breastfeeding was significantly associated with place of residence, institutional delivery, post natal advice on breast feeding and educational status. Urban mothers were more likely to initiate breastfeeding early as compared to their rural counterparts which was 73.5% and 47.3%, respectively (P < 0.001) (Table 2 and Figure 2). Among the obstetric and health service related factors, place of delivery and post natal information or advice on breastfeeding were significantly associated with timely initiation of breastfeeding (Table 3). Mothers who had formal education were 1.4 times as likely to initiate breastfeeding with in the first hour after delivery as compared to those mothers who had no formal education [OR:1.4 (95%C.I:1.03-2.03)]. 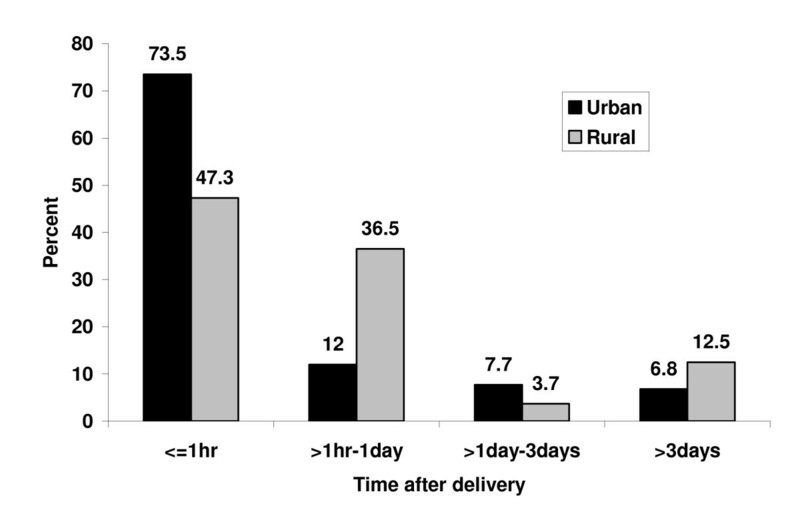 Similarly, urban dwellers were 3 times more likely to practice timely initiation of breastfeeding when compared to their rural counterparts [OR: 3.1(95%C.I:1.98-4.84]).Mothers who delivered in health institutions were twice as likely initiate breastfeeding as compared to those delivered at their home[OR = 1.9(95%C.I:1.30-2.71)]). Distribution of breastfeeding initiation by place of residence in Goba Woreda, South East Ethiopia. Mothers who were counseled/advised on breastfeeding on postnatal were about 52% more likely to initiate breastfeeding within the first hour of delivery [OR: 0.52(95%C.I:0.38-0.72)] (Table 4). On multivariable regression analyses after adjusting for other variable in the model, place of residence and information/advice on breast feeding at post natal visit were isolated to be independent predictors of timely initiation of breastfeeding. Urban mothers were 4 times as likely to practice timely initiation of breastfeeding compared to their rural counterparts [OR: 4.1 [95%C.I: 2.31-7.30], P < 0.001. Similarly, mothers who got post natal education on breastfeeding were 2.7 times more likely to initiate breast feeding within one hour after delivery[OR: 2.7(95%CI:1.86-3.94)], P < 0.001 (Table 5). COR = Crude Odds Ratio; CI = Confidence Interval. This study attempted to determine the prevalence of timely initiation of breast feeding including factors associated with timely initiation of breastfeeding. Majority 602(98.7%) of mothers practiced ever breastfeeding. This figure is similar to the ever breastfeeding rate of the country (96%) and Oromia region (94.1%) and other regional states in Ethiopia ranging from 93% in Addis Ababa to 99% in Harari [8, 17]. Although World Health Organization (WHO), global and national infant and young child feeding guidelines recommend that all newborns should start breastfeeding immediately (with in the first hour after delivery) and the feeding of colostrums be promoted, the current study showed that 35.0% of mothers squeezed and discarded the colostrums. This is due the cultural belief that colostrums can cause abdominal cramp in the child. The prevalence of pre-lacteal feeding in this study was 17.2% which is lower than the national pre-lacteal feeding reported by others (29%). The findings show that the reasons for giving pre-lacteal feeds are colostrums causes abdominal cramp, breast milk insufficiencies and to soften the stomach of the newborn. The prevalence of timely initiation of breastfeeding(52.4%) observed in the study area is better compared to the study report from Bangladesh where majority (88.8%) of the mothers initiated breastfeeding within three days after delivery and the prevalence of timely initiation of breastfeeding(41%) in Ghana . The prevalence of timely initiation of breastfeeding in this study was relatively similar with studies done in Sudan (54.2%), Jordan (49.5%), Amhara region (60%) and Southern Nations Nationalities and Peoples (SNNP) region (50%). But, the figure we obtained is much lower than those observed in other studies from North Jordan (86.6%), Nepal (72.2%), Zambia; (70%), Bolivia (74%), Ethiopia (national) (69%), Oromia region (77%) [1, 8–11, 14, 16–18]. The near average rate of timely initiation of breastfeeding in this study could possibly be attributed to the fact that in this study large proportion of respondents came from rural kebeles where timely initiation was less practiced (47.3% for rural and 73.5% for urban) and educational status is much lower in rural area as compared to urban. This can also be evidenced from the qualitative finding from Nurse, working at Goba hospital "...as I told you ANC providers are very responsible for promoting breastfeeding. But I think health care professionals are not doing well especially in this regard". Ethiopia has developed National Infant and Young Child Feeding Guidelines with the objectives of achieving optimal breastfeeding. For the implementation, many health extension workers have been trained to provide community level breastfeeding promotion and in-service training has been given to promote breastfeeding at the health facility level. Despite all these interventions, the basic and easiest indicator of optimal breastfeeding (i.e. timely initiation of breastfeeding) remains at a near average. Furthermore, timely initiation is predicted by the nutrition behavior change communication delivered at during the post-natal period, implying the need for strengthening the delivery of key messages for optimal breast feeding through postnatal contacts both at the health institution and at health post levels. The use of validated questionnaire and triangulating both quantitative and qualitative methods of data collection were the strengths of this study. However; a mother may have difficulty remembering when she initiated breastfeeding for her youngest infant; as a result, timely initiation of breastfeeding is subjected to potential recall bias. In addition, this study used a cross sectional study design; it is difficult to establish causal associations. Since the objective of this study is to assess the magnitude of the timely initiation and its determinants, we could not measure reason behind pre-lacteal feeding and colostrums removal quantitatively. Finally, this study is also limited to those missing data, thus interpretation of the finding shall take in to account the missing data. The study showed that the prevalence of timely initiation of breastfeeding was low. Pre lacteal feeding was common due to perceived traditional practices like, softening the stomach of the baby, breast milk insufficiencies, to avoid infant abdominal cramp. Maternal attendances of formal education, being urban resident and postnatal information/advice on breastfeeding were positively associated with timely initiation of breastfeeding. The factors associated with timely initiation should be taken into account while designing an intervention and, targeted, specific, and community oriented promotion of timely initiation of breastfeeding including women empowerment through education is recommended. We are highly indebted to Jimma University, college of Public Health& Medical sciences for financial assistance. We would like to extend our appreciation to Oromia Health Bureau and Bale Zonal Health Desk and Goba Woreda Health Office for providing the necessary information and facilitating conditions while carrying out this study. We are also very grateful to extend our appreciation to the study participants (mothers) who share their priceless time, supervisors, and the data collectors for their full commitment and psychological and technical support. Last, but not the least we are grateful for editorial members, reviewer of this publication. TS conceived and designed the study, performed analysis and interpretation of data and drafted the manuscript. MG assisted with the design conception, analysis, and interpretation of data and the critical review of the manuscript. TB assisted the study design, data interpretation and critically reviewed the manuscript. All authors read and approved the final manuscript.